"...little did I know the magnitude of what we would encounter just trying to sort this all out... well, let me tell you. I couldn't begin to guess what Kittridge did or didn't know and it certainly would have been interesting to see how he would have reacted to what we ultimately found." Vietnam veteran and widower Jeff Morgan inherits a mysterious manuscript from former platoon member, Robert Kittridge, who recently died from cancer. Reluctantly, Jeff accepts the manuscript and his new task of completing what Kittridge was unable to finish before his death. Morgan is affected by Kittridge's request in part because of his death from cancer, which rekindles the memories of his own wife, recently lost to cancer. The task of completing the manuscript symbolizes a small measure for Morgan to honor both Kittridge and his beloved wife. The manuscript itself seemingly details Kittridge's family history during the latter years of the Civil War. As Morgan begins his research he quickly uncovers information that pertains to a particular day during his Vietnam tour that directly affects him, Kittridge, and other former members of the same platoon. With the aid of beautiful, but stern Professor Lori Hathaway, the two work together amid a budding romance to unravel the mystery surrounding the manuscript before shady persons try to stop Morgan from completing the manuscript so that its secret never sees the light of day. 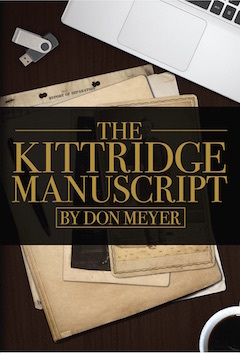 Award-winning author Don Meyer's The Kittridge Manuscript is a page turning tale of American history, political intrigue, mystery, and noir. Jeff Morgan, a quiet man who enjoys his decaf coffee and Vodka, becomes an unlikely hero who finds love again in a story linking together two significant wars of America's past. Meyer's novel is something reminiscent of Dan Brown's The Da Vinci Code and The Lost Symbol, with a unique twist of history and mix of with romance and political thriller. Meyer keeps you guessing until the end when you discover its final revelation that alters history as we know it forever. An army buddy leaves Jeff Morgan a manuscript that propels him into the mystery and suspense of trying to find out the reason for the unusual bequest. Along his journey to find answers he takes along Professor Lori Hathaway to help him decipher the clues. Along the rough road being traveled, people are drugged, knocked unconscious, photographed in compromising positions, and even killed before they find the reason that was so surprising that President Lincoln tried to cover it up. It is fun and refreshing to find people in their fifties and sixties, middle-aged, as lovers and heroes. Meyer really knows how to keep the reader spellbound in this page-turner. The fast-paced story begins when Jeff Morgan, a former Vietnam soldier, receives a call from lawyer Nathan Simon that one of his old army buddies, Bob Kittridge, whom he has barely thought of in years, has died and left him a manuscript—something that appears to be a family Civil War story—and that he wants Jeff to finish the research and compiling of the book. But Jeff wasn’t the first choice for this mission. A few other members of his platoon were on the list first, but one has died, one has dementia, and another is in prison, so they have all been eliminated from consideration, leaving Jeff as the heir or designated compiler of the manuscript. The Kittridge Manuscript is definitely a page-turner—so much so that despite being 355 pages, I read it in a day and a half and couldn’t stop thinking about it when I wasn’t reading it. Not only was I engrossed by the action and mystery, but I found it refreshing to read a story that has middle-aged people in their fifties and sixties as both the heroes and the lovers. Don Meyer definitely knows how to keep his reader spellbound, and the stunning final revelation is neither disappointing nor unbelievable. I hope Meyer writes more books like this one.